Over millions of years, extraordinary biodiversity evolved in Australia. And over many thousands of years, Aboriginal Australians met all of their food needs from our rich environments. But when Europeans arrived, more than 50 bird and mammal species disappeared within two centuries. Today, an astonishing 1700 species are at risk of extinction. Foxes and cats are the main threats, but their effects are far worse where fire regimes have changed and land has been cleared. Our project proposes to understand the impact of humans on the environment before Europeans came to Australia. With this knowledge, we can identify the best ways to promote environments that protect native wildlife. 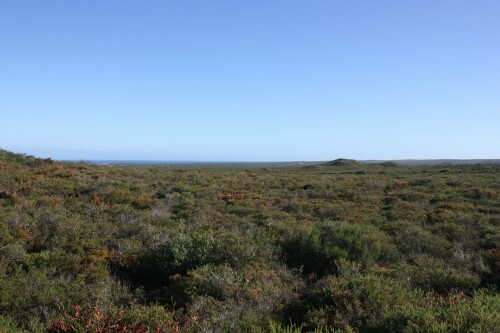 The kwongan shrubland of the northern Swan Coastal Plain is extraordinarily biodiverse and rich in fire-dependent plant and animal communities. Before Europeans came to Australia, Aboriginal people had developed sophisticated practices for managing their food supply, through social controls and through burning the landscape. Our aim is to determine whether these practices impacted the native fauna. We focus on the area between Jurien Bay and Leeman on the Western Australian coast, where cave environments preserve archaeological and palaeontological remains in the form of campfire ash beds, stone tools, and animal bones. The mega-diverse vegetation around these caves is the famous kwongan, harbouring thousands of endemic plants and unique animals like the honey possum, the only mammal that lives entirely on nectar. By identifying changes in animal species from their bones and DNA preserved in their bones, and the changes in human activity, we can understand how people hunted certain species and what impact hunting had. 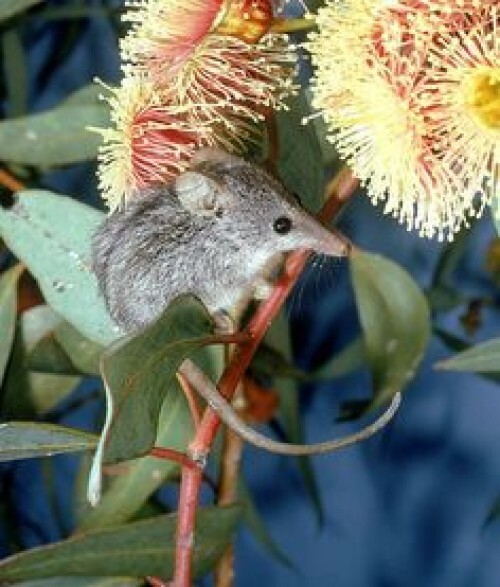 The honey possum (Tarsipes rostratus), also known as the Noolbenger, is a tiny, nectar-eating mammal found only in southwestern Australia. We can also understand the impacts of burning, by studying records of environmental change. Many animals require environmental conditions that can be altered by firing, so change in these conditions can be ascertained by studying changes in animal populations over time. In the first year of our project, 2014, we worked with local Aboriginal custodians and excavated a sample from a cave deposit that is full of animal bone and cultural material. We now hope to excavate at another cave nearby, to provide a "control" site where hunting was not a factor. But due to the time we had to devote to exploring the rich remains from the first site, we have few funds left to test the control site. We seek funding to return to the field and complete our study. Caves like this one provide a great opportunity to examine the archaeology and palaeontology of a region. Along with traditional Aboriginal knowledge, archaeological and palaeontological evidence can help conservation scientists understand how past environments were managed. Such information helps to identify conservation strategies that benefit endangered species. With your help we can improve the information that conservationists need to protect Australian biodiversity. By excavating in these caves, we can collect and examine animal bones and artefacts that tell us about the environment and people's behaviours. 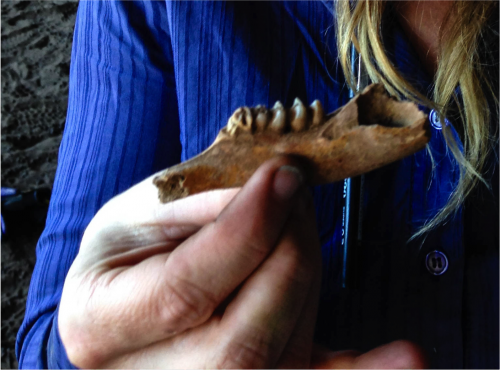 Animal bones - like this kangaroo jaw - tell us about the local environment and the diets of people who lived here. Much of our archaeological research is conducted on a shoestring budget. We are seeking financial support to help with the costs of fieldwork (travel to and from the site, accommodation, food and engagement of Aboriginal Traditional Owners). Our 2014 field team - comprised of archaeologists, Aboriginal Traditional Owners, university students and volunteers - in full swing! Our largest expense is the engagement of two Aboriginal Traditional Owners, who represent the Amangu people who speak for the Country on which this research is undertaken. $2400 will be used to cover their employment, daily travel and accommodation expenses. We're also expecting to transport, house and feed four researchers and students. We're seeking funding for vehicle fuel - $250, food - $450, and accommodation - $450. Radiocarbon dating is an expensive and essential part of archaeological research. To answer our research questions, we need to be confident of the timing of changes and events. Radiocarbon dating is undertaken at dedicated laboratories, and costs about $650 per date. We would like to date 4 to 6 samples within the site to establish a chronology of change through time. Any funds raised beyond the target costs will be used to pay for additional dates, and other laboratory costs associated with analysis of the excavated material. You will receive a selection of 5 digital photographs of the caves or surrounding environment, taken during our 2014 and 2015 fieldwork. These images will be sent to you as digital files, for you to print or use as you wish. Your generosity will be acknowledged in Carly's PhD thesis and at least one peer-reviewed publication. You will receive a personalised tour of the UWA Archaeology laboratory. (Individual Donor) Join us for a tour of one of the research sites and surrounds, with the archaeological team including Traditional Owners. Please note: The sites are located about 4 hours drive north of Perth. To receive this perk you must be able to make your own way to the site. (Corporate or Group Donor) How can archaeology help with conservation? We'll present on our research and its implications, for your company or organisation. We'll conduct a full-day workshop on the identification of archaeological and/or faunal remains, either at UWA or at a suitable venue of your choice. * $1,110 in offline donations included in total.